Big thanks to our friends at Kendell Doors & Hardware for helping us restock our supply shelves! All donated school supplies are distributed to Winona County k-12 students in need of assistance. 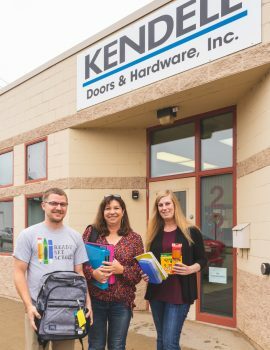 Pictured (L-R): Blake Koebke, RSS Board Vice President; and Karen Palencia & Molly Adank of Kendell Doors & Hardware.